ab 20:00h !!! ab 20:00h !!! ab 20:00h !!! der obere floor am Aquarius 2007 wird um 20:00h eroeffnet mit einem reinigenden "schall- & rauchritual". nah chill hamma net - aber das Freestyle-Intro von der Batusim Mafia mit feinstem, ueppigem electro-proggy groove & oldschool goa & fullon. Alle die von 20:00h - 21:00h eintritt zahlen bekommen früchte und 1 chai gratis von KuNsTKopF . Brauchen aber bons damit keiner ein dauerchaireinschütter wird. "V.A. - Psychic Chakra" und andere blaster von Geomagnetic Records CDs bieten wir dir dann ab 22:00h auch (zu einem very nice price 4 you) zum kaufen an - also no worries, is für jeden was dabei denk ich ! 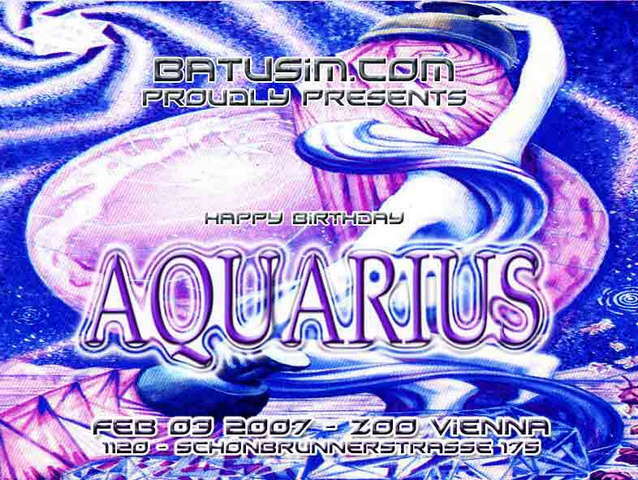 @ Betty B & AnzaFranz & Miguel & all Aquarius: Happy Birthday !!! 40%, Omri Harpaz AKA Omi was born in 1977 in Israel. Throughout his early childhood years Omi was allured and fascinated with music. As a music enthusiast Omi developed a drive to explore his enthrallment towards general music. Eventually, Omi experimented throughout many genres of music ranging from heavy metal to punk, new age and garage. By the age of 15 Omi discovered electronic music which immediately captivated him. It was shortly after attending a trance party when Omi began his quest to conquer electronic music. He began to DJ & perform throughout Israel and soon enough his name was widely spoken among party people as one of the best djs around. including Germany, Holland, Belgium, Portugal, Russia, USA, Kenya, Japan, Mexico, Brazil, Belgrade and more. Omi performed in various kinds of events ranging from small underground parties to massive world renowned festivals. After DJing for several years Omi reached a stage in his life where he felt the need to rise. That rise lead Omis creative insight and imagination into the world of music production. Throughout his early production days, Omi produced under the name of "Digital Manta". During this period Omis main influence and style was progressive trance. Digital Manta released several tracks with major labels such as MDMA and Vision Quest. After mastering the art of producing Omi once again decided to ascent and formed his current live act and producing alias as "40%". 40% is mainly influenced by the rapid changes in the trance scene and is geared more towards the full side of trance music. 40% music cannot be pointed down as a specific type of trance as it has much diversity and is a very unique style in the trance scene. Third Eye , Spliff Music, Sirius, Moonspirit, Crystal Matrix and others. During the year of 2004, 40% compiled a compilation for Sirius, a label based in Tokyo Japan. The name of this compilation is Transparent Image and was recognized a major success internationally. Blt, Exaile, Paranormal Attack, Beat on Fobia , Rocky and many more. Sonic Fusion, the charismatic artist, "Godfather of Psy-Tribal", "Tribal Warrior! Music that supports mankind's step into the 5th dimension, the Cosmic Age. Sonic Fusion is a professional musician since 1986 and played live for millions of people around the world since 1995. In his powerful live performance he plays on black light (UV) responsive electronic drums with glowing drum sticks and excites the audience with psychedelic styling. Sonic Fusion released 59 records and CDs on major and independent record labels and several tracks climbed up the playlists of progressive radio stations and the top-10 charts of the most well-known DJs of the international Psy-Trance & Goa scene! In his discography you can find floor-killers like Tribal Warrior, A Proper Cup `O Coffee (Remix), Emotions, Into It, Wild Boyz (Remix), Tokyo, Fire Dance and others that achieved cult status. Sonic Fusion’s music is featured on music videos, awarded feature films, TV series, radio shows, computer games, stage plays and installations. Sonic Fusion is one of the most exciting live acts in the Psy-Trance/Goa scene! Brand new music tracks and recent releases will be presented at the Sonic Fusion world live tour 2007. € 7,- fuer wassermann geborene MIT AUSWEIS! FREE ENTRY fuer geburtstagskinder (3.feb.) MIT AUSWEIS!